with all of the vibrant leaves in their full glory i am reminded why the fall season is so well loved. the roadside stands are brimming with all manner of harvest and children buzz with excitement over costumes, haunted houses, and which neighborhoods give the best treats. something i love about fall is acorns. i think they look great in a cup or bowl or just a few sitting on the corner of a table. pumpkins are great too, who ever thought there would be such a "love affair" with a vegetable that most of us only use in pies? 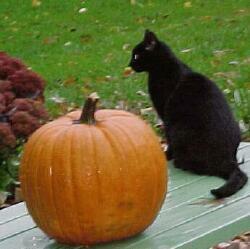 they come so many sizes and colors and shapes that it's hard to go home from the pumpkin patch with just one. the "blue" pumpkins go perfect with the new paint on my kitchen cabinets and i still need to go out and get a few. and leaves...my kids love to gather them into colorful bouquets and then toss them into the air. raking leaves and burning leaves are also an important ritual of fall. as you begin to prepare your "nest" for winter take time to savor the season's best and give thanks for the many every day blessings that we have been given. 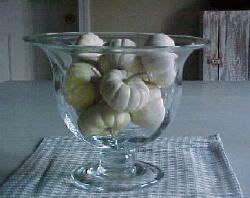 an easy table centerpiece for fall that can last into winter is an over-sized glass compote. 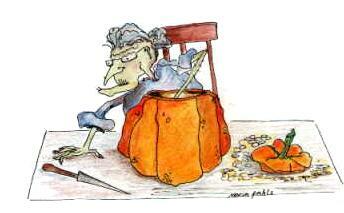 in the fall months fill with "jack be littles", "patty pan" squash, or miniature gourds. 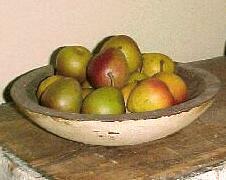 as november approaches change the contents to miniature pears in beautiful green with splashes of red. small apples would also look great. as december nears, the bowl can be changed to cumquats, lemons,limes or a mixture of these citrus fruits. consider glass ornament balls for christmas. use a small penny mat or scrap of homespun under the compote. washing the glass in sudsy water and air drying with out rinsing will yield the most sparkle. 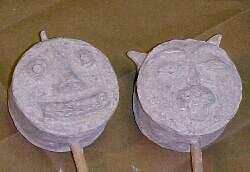 this little shaker can be made for halloween or changed to a snowman face for winter. easy to find and inexpensive items make it economical too...and if you speed up the drying time with a portable fan can it completed in just two days. note: you may wish to remove one side of card board to do these steps and replace with glue when finished. 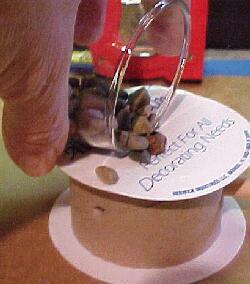 you can also make this project by leaving the ribbon spool in tact. allow white glue to dry before proceeding to next step. cut the dowel rod to 11 ½" using snips. set aside. use the awl to punch a hole slightly smaller than dowel in the heavy cardboard part of the ribbon spool, centering hole. 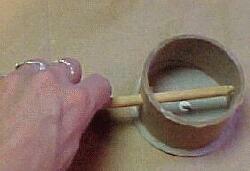 push the dowel into the hole until it touches the top of the tube. 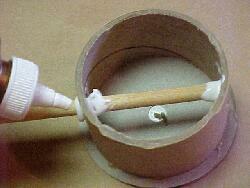 secure the dowel with a ring of craft glue where the dowel meets the base. add more glue if the cardboard side is removed. allow glue to dry. 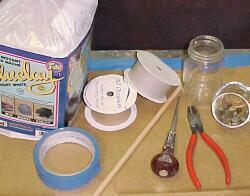 cover one hole in the empty ribbon spool with masking tape. pour gravel into spool. 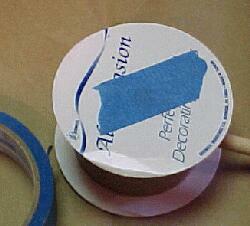 (replace missing cardboard side and glue in place) cover second hole with tape. mix up the paiper mache with very hot water. the consistency of the mix should be slightly more watery than cookie dough, yet hold together when squeezed in the palm of your hand. 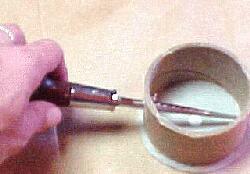 apply paiper mache to the center of the spool where shown (on jar) using the palm of hand and fingers to smooth mache. place on jar to dry. place a bit of mache in center of cardboard circle and use a finger to pat it out to the sides. add additional mache as needed to cover. form simple shapes with hands and add to shaker to make a face. 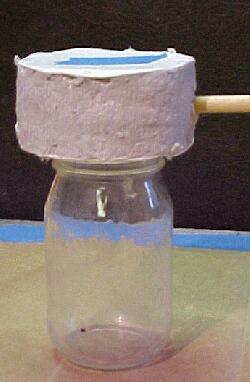 allow to dry upright on jar. cover second side, adding a face to second side if desired. dry. add more mache to center spool to make even with the "face" sides. the surface of the shaker can be left rough or made smooth by applying additional thin coats of mache. also sanding can yield a smooth surface. dust and any mache that is on the stick should be removed before painting. modeling with dremel tool can also be done following manufacturer's safety instructions. 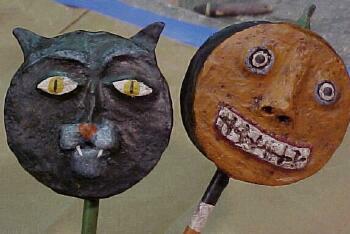 paint the stick as desired and allow to dry. paint the shaker, one side at a time, adding as much detail as desired. 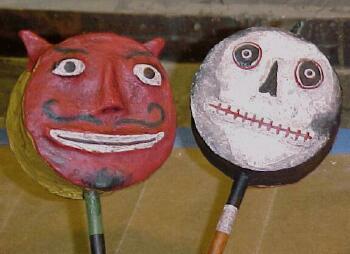 paint the center of the shaker a contrasting color or match to the paint on the face. antique with gel stain or apply mica flakes with a thin coat of white glue. spray with matte sealer. use several shakers to display in a jar or pottery vase or give as party favors with guests names written on the back or with a paper tag attached to the stick. © 2001 maria pahls. this design is for fun only and not meant for sale in any form finished or pattern. michigan scarecrow festival check out the contest winners! "And hast thou slain the Jaberwock?